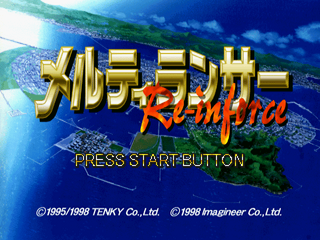 MeltyLancer Re-inforce (メルティランサー Re-inforce) is a 1998 strategy game for the Sega Saturn by Imadio and Nextech and is part of Imagineer's/Tenky's MeltyLancer video game series. Main article: MeltyLancer Re-inforce/Magazine articles. IMG_ABS.TXT TXT (Abstract) 391 About this game. Note:Disc1, 2 and 3 are included same content.